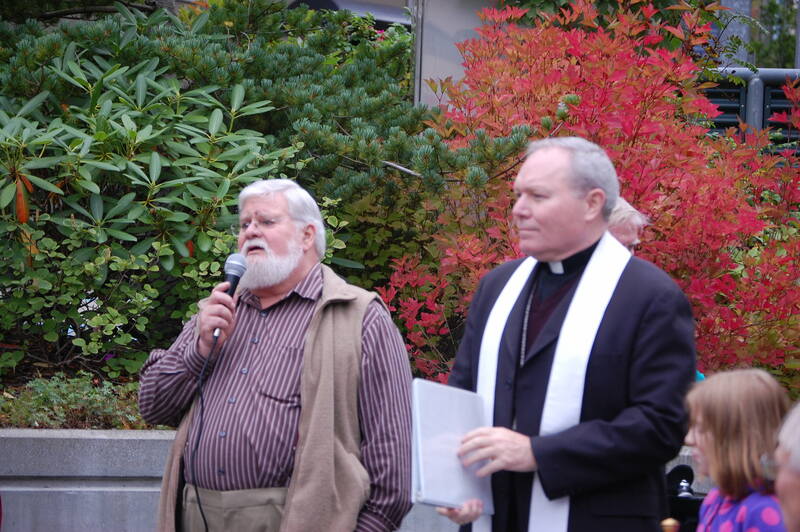 Bishop Edward Burns and members of the Juneau community gathered on Friday, September 21st to dedicate a downtown Juneau park at the corner of Third and Seward Streets in honor of the late Bishop Michael Kenny. 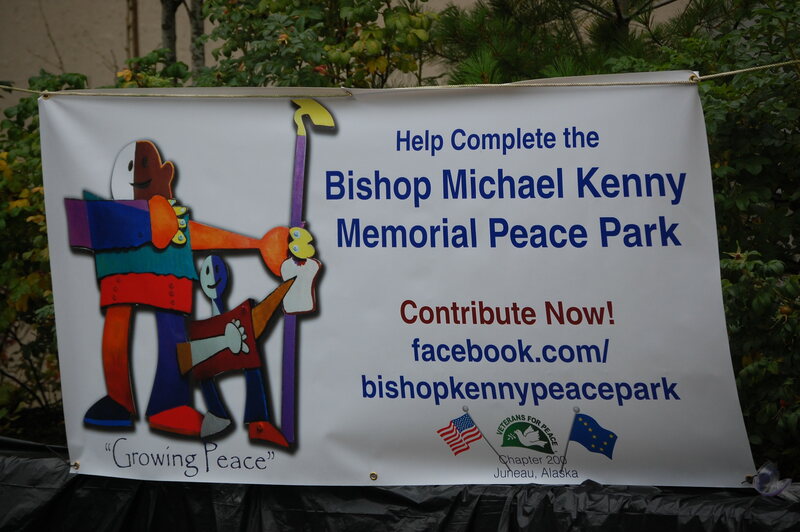 The Bishop Michael H. Kenny Memorial Peace Park was officially christened with holy water during the Friday ceremony, and a colorful, abstract sign, created by local Juneau artist Aaron Elmore, bearing the park’s name was unveiled. 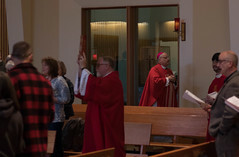 “My friends, I ask that you join me in asking God’s blessing upon this peace park, that it may be a sign for all in this community and a remembrance to work for peace,” said Bishop Edward Burns, the current Bishop of Juneau. The local Veterans for Peace chapter—a nonsectarian nonprofit organization—spearheaded the naming of the park. Phil Smith, Veterans for Peace chapter president, stated in the Juneau Empire that they originally planned on simply naming the spot “Peace Park,” but discovered the city does not allow parks to be named after concepts or ideas. It needed to be named after a person. Kenny was the Bishop of the Diocese of Juneau from 1979 to 1995. He died suddenly while traveling in Jordan from an aneurism at the age of 57, and is buried in the crypt underneath the chapel at the Shrine of St. Therese, Juneau. 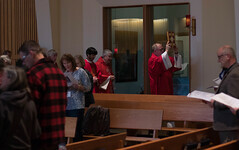 The Diocese held a 75th Memorial Celebration of his life this past June. The late Bishop Kenny was a leading advocate for peace and nuclear disarmament, and was often referred to as “No Nuke of the North” by his fellow bishops. 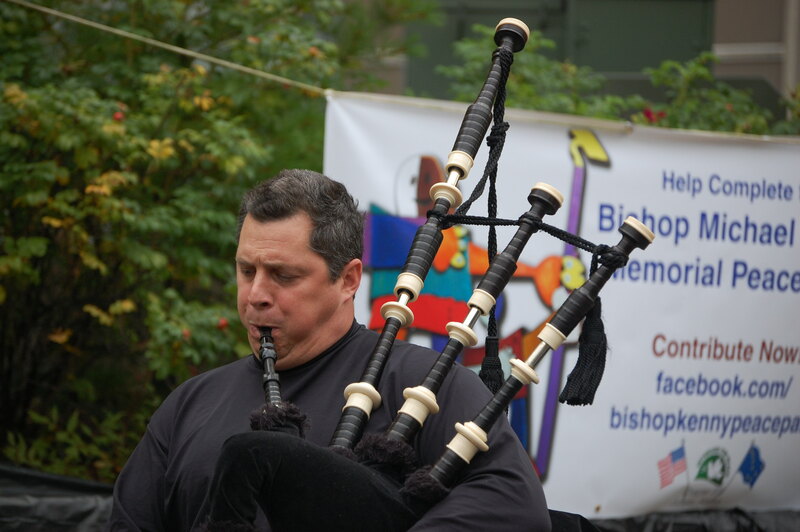 Other contributors to the ceremony were: Mayor Bruce Botelho; Brent Fischer, director of City and Borough of Juneau’s Department of Parks and Recreation; the Alaska Youth Choir; and, a local bagpipe ensemble. A public art sculpture designed by local artist Jim Fowler, titled “Growing Peace,” will be installed in the park next spring. The Veterans for Peace chapter has already begun fundraising to support this effort. “In… the 1940s, pacifisits seemed a small albeit respectful group: Quakers and a few select others whose religious convictions forbade them to participate in war. Without agreeing with or even understanding their position, I admire them for their sincerity and fidelity for what they believe.